At the BBC hackday “Mashed” earlier this year, I went to a talk explaining how to write applications that can be delivered to televisions through Freeview set-top boxes. For our CurrentCost-themed hack, we reused (that is to say, shamelessly stole!) some code from a colleague to get CurrentCost notifications onto a TV channel. 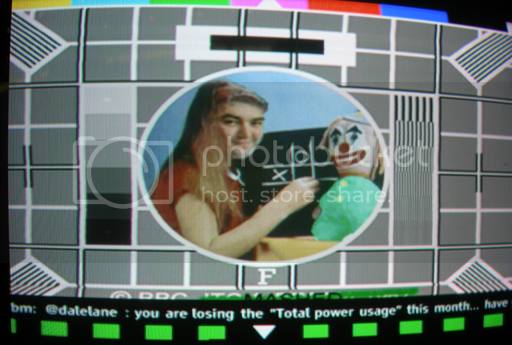 The idea was that it’d be a ‘press the red button’ kind of thing where you could have results of CurrentCost challenges from you and your friends pop up as text overlaid onto the bottom of the screen while you watch TV. I loved this idea, and it’s been bouncing around at the back of my head since. There is a lot of social network data on the web that I think would be well suited to notifications via a TV. Rather than needing to have a separate computer on, or send stuff to mobile phones, or use stand-alone ambient type devices like Nabaztags or Chumbys, why not have stuff popping up while you watch TV? Yesterday was the end of Mashed 08 – the annual London hackday from BBC Backstage. I saw last week that there was going to be a “social responsibility” category in the hack challenge, and decided that a CurrentCost hack was in order! Together with Rich, we spent a day trying to hack together a competitive challenge based around CurrentCost, encouraging people to reduce their home electricity usage by making it into a game they can play with their friends. Here are a few notes based on the presentation I gave at the end.